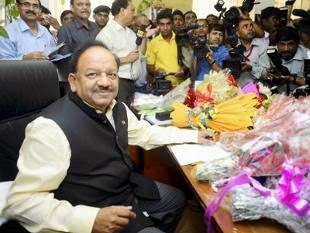 Dr. Harsh Vardhan, who took charge as Union health minister yesterday, has promised that the government would work to provide health insurance cover for all through the Rashtriya Swasthya Bima Yojana (RSBY), a national health insurance scheme for below poverty line (BPL) families. In order to seek suggestions to implement the scheme, Dr. Vardhan met senior officials in the ministry and briefed them about the priorities of the new dispensation. “The RSBY scheme, run under the ministry of labour, is working fine in some states but its reach is limited to BPL families. I plan to rope in all economic groups and make the health ministry a sort of regulatory body for oversight on existing microhealth insurance programme in the villages and cities of India", Dr. Vardhan added. “I am not in favour of taxpayers' money being used to push a one-size fits all health policy. I have started contacting public health practitioners on the roadmap to ensure that available resources will be utilized more optimally", he added.